Well here are our lunches! Hainanese Chicken Rice, Curry Leaf Pesto Pasta, Veggie Rice Bowl, and Brown Rice Bibimbap. At Nourish Me they uses fresh ingredients, brown rice instead of white rice, low saturated fats, sodium, sugar and hi fiber. I enjoyed my Brown Rice Bibimbap very much because it has lots of fresh vegetables, mushrooms, egg and tofu. It’s totally healthy and delicious too. All their meals are nutritious, wholesome and come with calorie counts and nutritional information by Alexandra Prabaharan. With American Fitness Professionals and Associates (AFPA) certified nutritionist Alexandra Prabaharan's crafted recipes, and an affordable price point, you'll be on your way to a healthier and more balanced lifestyle, all while saving a substantial amount of time and money. 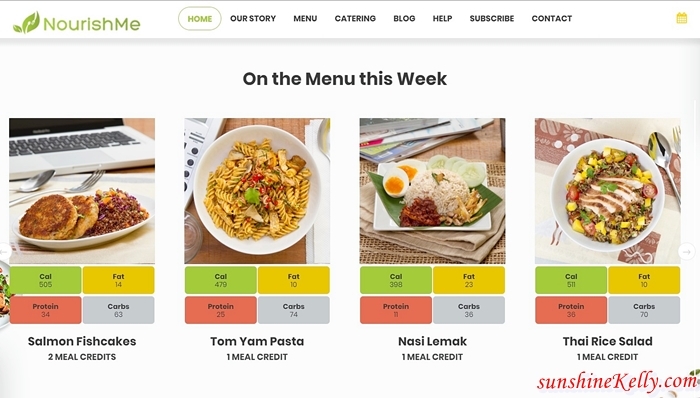 Head over to their website at http://www.nourishme.asia you can find that everyday Nourish Me offers five regular options from our regular menu and one premium option. You will not get bored with their wide selection of nutritious dishes including healthy versions of tasty local dishes, unique fusion meals, mainstay Western, vegetarian, and low-carb diet sensitive favourites. I prefer to have my lunch in the office because it save time and trouble of heading out in the hot sun for a meal. All you have to do is Subscribe to Nourish Me monthly package, they have 3 options which is Complete, Moderate and Light. That depending on your lifestyle, schedule and how you want it. Here I have some good news to share with all my fans and readers, you can get 20% discount at Nourish Me when you use this promo code “NOURISHSUNSHINEKELLY”.